I never really saw the appeal of hair masks until recently — probably because up until my foray into the land of rose-gold hair, my un-dyed locks weren't in need of deep treatment. They were silky smooth on their own, and suddenly, they weren't. Not that dyeing my hair ruined it, but the texture definitely changed, becoming more coarse and prone to flyaways. You don't know what you've got till it's gone, right? 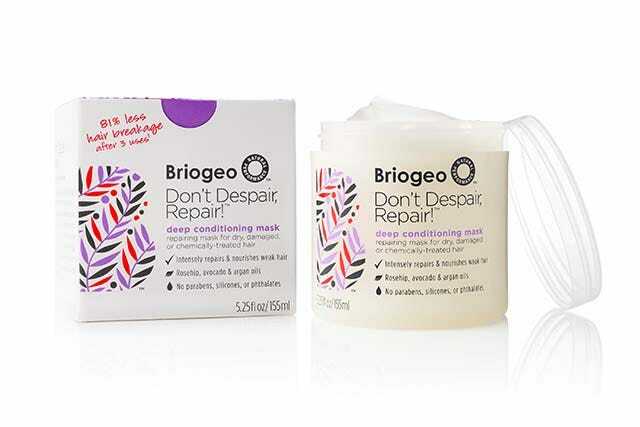 Miraculously, I seem to have recovered my hair's texture with the help of Briogeo's deep conditioning mask, called Don't Despair, Repair! I'm not exaggerating when I say that this is the single most effective hair treatment I've ever used. My hair has returned to pre-bleach health (to the touch, at least), and I swear I'll never take it for granted again. Apparently, I'm not the only one singing the praises of this all-natural wonder. A test group experienced 81% less breakage after three uses than with regular conditioner. It's made with a powerhouse blend of all the good guys that come up when talking about natural hair care: avocado, argan oil, almond oil, keratin protein, rose hip oil, and a bunch of vitamins — B5, D, A, and E, if you're wondering. Like most hair masks, you leave this friend on for about five minutes after shampooing. When I worked it through my hair, I could almost hear my locks sighing with relief. I rinsed, and then went to bed with it damp. I woke up with shiny, silky-smooth waves. I wasn't emotionally prepared to wear my hair wavy (it's pretty straight), so I straightened it. Luckily, the heat styling didn't ruin the soft texture. I actually ended up putting some dry shampoo on it to get it to be more texturized — I like hair with a little bit of grip, rather than the slippery, shiny finish I woke up to. Briogeo was inspired by founder Nancy Twine's mother and grandmother, who made their own haircare products. This mask definitely feels like it was made with multigenerational maternal love. I can't wait to start using this on the regular — suffice to say, I guess my shower routine just became five minutes longer. Briogeo Don't Despair, Repair!, $26, available at Briogeo.